Riverside Meadows is located just east of the town of South Fork, Colorado, off US Highway 160. We are open year-round! Riverside Meadows was built entirely by the Owners Fritz and Paula Allen, along with their daughter, Sadi, and we would like to welcome you to our home! This is our primary residence, and we will most likely be here for your stay. Your individual cabin will allow you as much privacy as you like, and we will be available to help with any questions and/or problems that may arise. "HIDDEN GEM: This place was beautiful! The cabin was nice and clean. Having the river right next to your cabin was an added bonus! We definitely recommend this to anyone who happens to be in the South Fork, CO area!" "MAGNIFICENT FISHING!! A TRUE GEM FOR A GETAWAY! Riverside Meadows Cabins are ideally located, off the beaten path (do not use google maps) use the instructions given by Fritz. 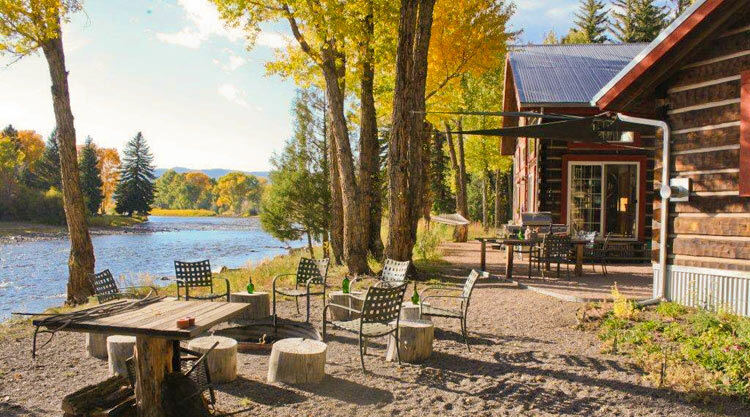 The cabins are located adjacent to Rio Grande river in the gold metal fishing waters on 8 private-secluded acres. The cabins are Norwegian-style dovetail log homes, there are three and we stayed in the guest cabin. The cabin is really beautiful, nice view of the river from the front window and screen door. Their are homey touches throughout the cabin that represent the Norwegian culture such as hand-carved colorful masks and traditional clothing, it has a queen sleigh bed that is very comfortable, large bathroom and closet-very clean. We did not use the Wifi, wanted to stay disconnected. Amenities included a hot tub on site, and inflatable kayaks with shuttle service. We only spent one night here, but think it would be a great basecamp. We really wish we could have spent our entire week here. Fritz and Paula Allen are the ideal hosts provide help when needed. You will awake to the sounds of the river early in the morning. For fishing along the bank there is 70 feet of river frontage to fish, the best method was to cast upstream and let the fly run with the current. Hubby caught a really nice brown trout. The fishing here is really awesome, would highly recommend staying here just for the fishing. Fritz and Paula have created a wonderful place to rest and renew. It far exceeded my expectations in beauty of site, friendliness and helpfulness of hosts, cleanliness and any other category I can think of. We stayed in the studio and brought our 2 dogs while our friends stayed in one of the cabins. We all agreed that we had such a nice time that we plan to go back. With the river running right next to the property, it made the 'trip' to go fishing extremely easy. Just walk a few steps to the bank of the river and there you are! An especially nice aspect of the stay was the great time we had at the fire ring at night. We met wonderful and interesting people and had an excellent time. Thanks Paula and Fritz. We look forward to coming again." "GET AWAY: This place is amazing!!!! The owners are beyond nice. My husband has a fear of water and I really wanted to kayak. They talked us through the whole process, and then went above and beyond to go with us. ( I think this is based on how busy they are) this was one of my top adventures. The ride was about 2hours. Cabins right on the river. They have hot tube, kayaking, and grills all included. Only thing depending on time of year, be prepared for mosquitoes. However the do provide bug spray. We will definitely be going back. Again just amazing owners and experience.